George L. Weeden of Montgomery, NY, a longtime resident of the area passed away Monday, July 2, 2018, at home. He was 86. The son of the late William and Florence Lemin Weeden, he was born January 30, 1932 in Goshen New York. He served in the Army during the Korean Conflict, serving one year in the States and one year in Korea, with the rank of Sergeant First Class. He worked as an Engineer for the Orange County Highway Department, Goshen, NY. 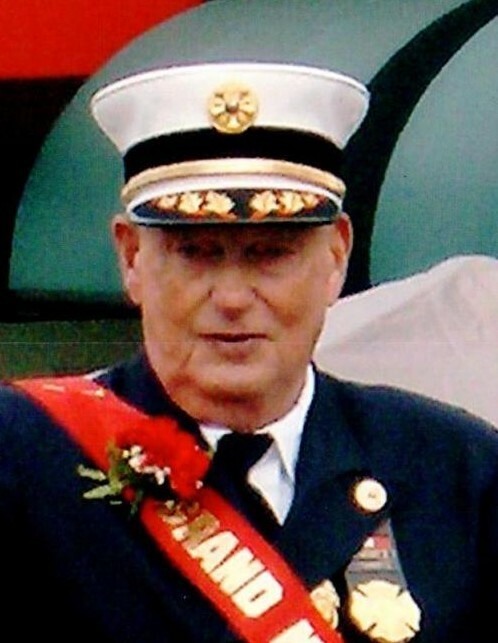 He was a member of The Montgomery Fire Department, having served as a past President and past Chief; and Life Member, 4 times past President, and past Captain of the Wallkill Engine & Hose Co. No. 2, both since 1951 (68 years); he was past President and Life Member of the Orange County Volunteer Fireman's Assoc. ; Past President and Life Member of the Orange County Fire Chiefs Assoc. ; Past President and Life Member of the Hudson Valley Volunteer Firemen's Assoc. ; Life Member of Firemen's Assoc. of the State of New York; Member and Trustee of the Inter County Volunteer Judges Assoc. ; Honorary Member of the Greene County Volunteer Firemen's Assoc. ; Honorary member of the Sullivan County Volunteer Firemen's Assoc. ; Past Trustee of the Village of Montgomery; Life Member of the American Legion Post 521, Montgomery; Life Member of the Veteran's of Foregin Wars, Post 2064 Maybrook; Director of the Orange County Fireman's Museum of Montgomery, NY; Member of the Village of Montgomery Planning Board (in the 4th 5-year-term); 50 year Member, Past Trustee and Past Deacon of the First Presbyterian Church of Montgomery; and a Member of the Outpost Harry Survivors Assoc. He was a wonderful and loving husband, father and grandfather. And a great mentor to his children and grandchildren. Survivors include his wife of 65 years Grace W. Weeden of Montgomery, Son Howard Weeden and Karrin of Walden, Son Steven Weeden and Lori of Montgomery; Grandchildren Jonathan (Allison), Katherine (Scott), Adam, Jason, Michael (Leyla); GreatGrandchildren Graycen, Dune, Lars, Marshall, Miles; Brother William Weeden of Tennessee. Visitation will be Thursday, July 5, 2018 from 2-4 & 7-9pm at Overhiser Funeral Home, 78 Union St., Montgomery, NY 12549. Firematic services will take place on Thursday at 7 p.m., followed by the Veteran's Service at 7:30 p.m.
A funeral service will be Friday, July 6, 2018, at 11 a.m. at the First Presbyterian Church, Clinton St., Montgomery, NY. Pastor Jeromy Howard will officiate. Burial will be in St Mary's Cemetery in Montgomery, NY.